Dive watches have been around since the 1950s and the first thing you’ll notice is that most are bold and chunky because they are designed to withstand the underwater pressures while also looking good on your wrist. They are also versatile meaning they come in different styles with features that vary. The material, depth rating, and rotating bezel are some of the features you should consider to ensure that you get the right dive watch for your money. Whether you are looking for a luxury, automatic, digital, or just a good looking stylish dive watch, the market has great offers. Through research, I have compiled five best dive watches under $200 with great features that hold their own against much-overpriced watches. Dive watches are considered as a statement and are essential for aquatic adventures. Dive watches help scuba divers to keep track of time when diving and to know the air pressure left for the diving session. Dive watches construction is durable, and snorkeling swimmers can enjoy underwater life with these easy to read and waterproof pieces. You can time yourself with a dive watch when free-diving to see how long you can hold your breath underwater until you resurface. Dive watches have a water resistance of at least 200m and above and can be used by anglers who enjoy spear-fishing to know the time they spend underwater when fishing. The first consideration was functionality. How well does the dive watch perform under water? Second, versatility.Can the watch be used for recreational scuba diving, surface water sports, professional marine activities and/or swimming? Third, the overall quality and lastly, the price. All these dive watches are under $200. 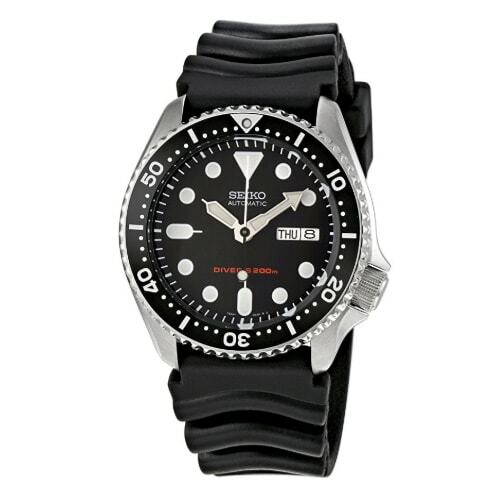 The Seiko Men’s SKX007K automatic is a timeless dive watch with classic and durable construction. It’s affordable and boasts great specs. The SKX007K case is stainless steel and approximately 42mm wide and 46mm with the crown included, hence can accommodate a wide range of wrists. The lugs are 22mm apart which makes this watch to be different from other band types. The sides of this case are also highly polished, and the lugs top features a fine-brushed finish making light and soft on the wrist. The case is ISO 6425 certified meaning it meets safety standards of a real diving watch. It also boasts an impressive water resistance of at least 200 meters and 660 feet making watch suitable for recreational scuba diving. 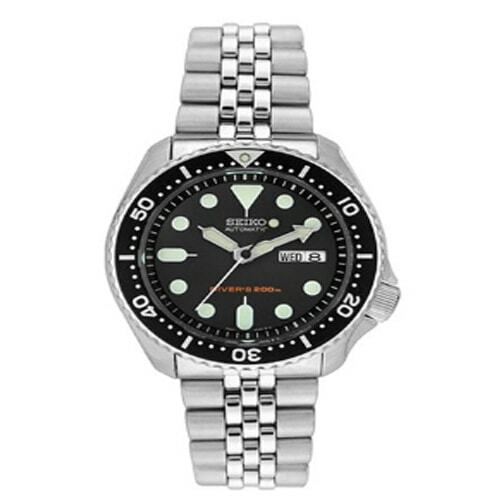 Seiko SKX007K safety features include a stainless steel bezel with a jagged outer edge which is unidirectional. This feature is a safety measure to ensure that you cannot accidentally turn the bezel in any other direction. The mechanism is ratchet enabling you to hear audible clicks when the bezel rotates with each click representing ½ a minute increment. This feature allows the divers to set the time they want to stay under the water, and at the same time know the amount of energy left for the dive. Its dial window has a tough hardlex crystal glass, which reflects more light and is highly resistant to scratches and knocks. It is also shock-resistant and hardened to protect your hands, movement, and dial from water and dust. Again, it is bold and straightforward with strong hands and lumed hour markers. The watch face has no numbers, but the white circular markers contrast with the black background for easy reading. It has a simple but reliable automatic self-wind 7s26 with 21 jewel movement system. The move is approximately 20 to 40 sec per day, and it’s adjustable for accuracy. It powers automatically with your arms movement and doesn’t require a battery to function. This watch stops if not worn for about 40 to 48 hours though it’s easy to get it working again. Seiko Men’s SKX007K is among the best dive watches under $200. 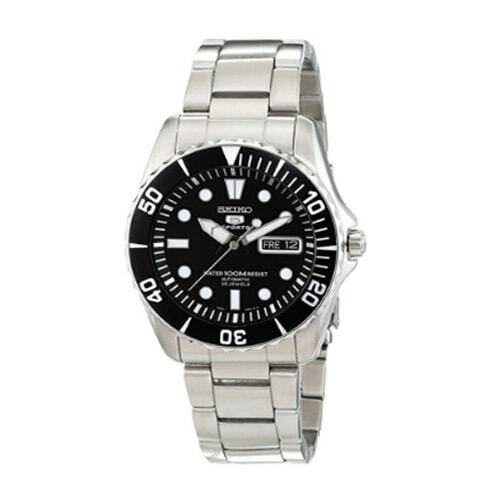 It’s an excellent watch for recreational scuba diving that has a classic look, and you can wear them on other occasions. 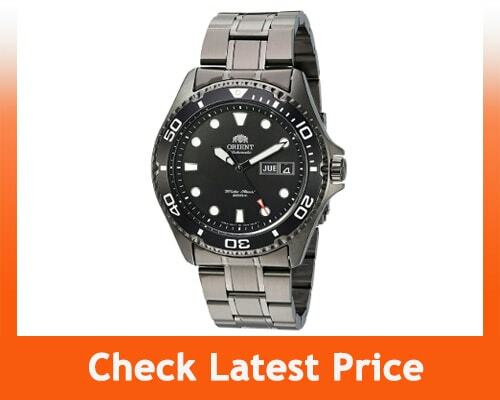 This watch is ideal if you are looking for a durable dive watch since has quality and uncluttered features. To ensure that your watch provides you with reliable service; you need to service it every three years, rinse it in fresh water after use and thoroughly dry it. Seiko Men’s SKX007K2 is another dive watch that we like since it’s a traditional timepiece with personalized features hence suitable for diving. The case of SKX007K2 is solid with a diameter of 42mm and a thickness of 13mm. The case is stainless steel, and the mirror is polished. It also features a silver-tone bracelet also made of stainless steel meaning it can’t change color or rust even after using it for years. This particular brand features a jubilee bracelet which is comfortable but doesn’t sit well with the case. The bracelet is removable though so you can replace it with a leather strap or any other that fit the case. The design of the case matches the size of the watch to give you a snug fit. Just like SKX007K, the case is ISO 6425 certified meaning it meets safety standards of a valid diving watch. It also boasts an impressive water resistance of at least 200 meters and 660 feet making watch suitable for recreational scuba diving. The dial of SKX007K2 has dot hour markers and luminous hands which are essential for scuba diving. The dial window is a hardlex crystal that is resistant to scratch. The dial type is analog but durable, and the visibility is excellent meaning you can read it under the water in any light condition. It also features Seiko’s Lume to help it provide backlight for long hours when fully charged. The bezel has a stainless steel material, and its function is unidirectional. This dive watch has 7S26 automatic movement and reserve power for about 40-hours. This timepiece features both 24-hours time and 12 hours time with day and date features. Both date and day feature is at the 3 o’clock position of this watch. Seiko SKX007K2 is a quality dive watch and worth the money. This timepiece is smart, sturdy and long-lasting. It’s the best watch for recreational scuba diving. This watch is without a doubt built for function, but you also have to service it after every three years for it to serve you for long. Orient Ray Raven II comes in third in our list of best dive watches for various reasons. It comes with F6922 Orient caliber movement with 22-jewel, hand-winding option, and 120-click bezel that has been upgraded making it a reliable timekeeper. 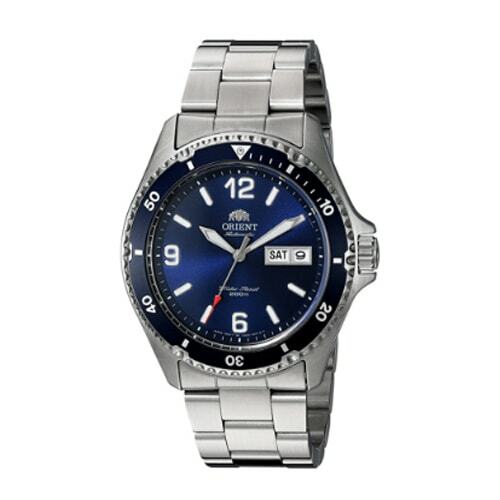 Orient Ray II boasts a smooth stainless steel case with flowing lines. The shape is bold and straightforward with a crown and guards at 3 o’clock, and you can still adjust it through the screw down crown. It also features shortly curved lugs placed on the circular center. The case is solid, and the screw down crown prevents water and dust from entering into the movement. This timeless piece has a water resistance of about 200m making it suitable for surface water sports and professional marine activities. The case is the best pick for people who prefer a more massive watch for the sports activities. Raven Ray II boasts a unidirectional, 120-click bezel which helps to track elapsed time. It is mounted on the 13-mm thick case to give the watch a bold design and a contrasting look that improve precision. Like most dive watches the bezel rotates counter-clockwise only to avoid turning it backward accidentally when under the water. Raven Ray II is an improved version of the first Ray Raven which is now powered by caliber F6922 automatic movement with 22 jewels making it a reliable timekeeper. It’s worth remembering that automatic watches at times don’t keep perfect time when outside the box. Ray Raven II movement also takes time to “break in” and somehow it ticks seamlessly making it not so accurate when outside the box. With the built in-house hackable movement and self-winding this mechanism runs one second fast to achieve the best accuracy. The battery reverse of about 40 hours and the robust heartbeat makes this timepiece to hold longest wrist time compared to other dive watches. 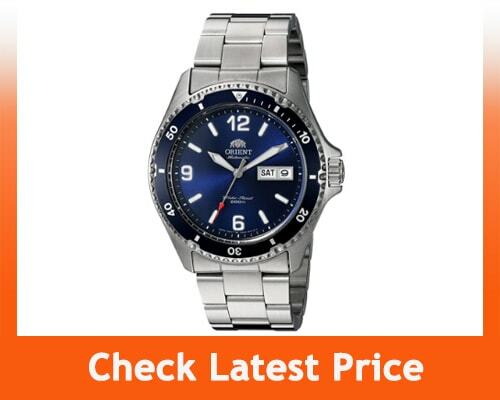 Orient Ray II provides excellent value for money. The easy to operate bezel, dial design, hand-winding and hacking movement are among the quality features that make this piece stand out. This watch is stylish and a reliable timepiece for diving. 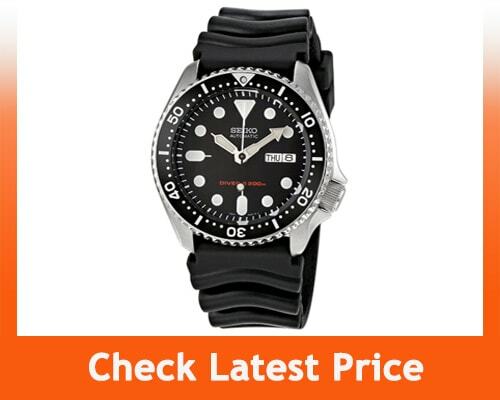 The SNZF17 also nicknamed as Sea Urchin is another great dive watch featured on our list. This timepiece design resembles a Rolex submariner hence the nickname. It features unidirectional rotating bezel, index markers, a stainless steel case, hands and markers coated with lume and a white and black color scheme. The case of SNZF17 is made of sturdy stainless steel material and displays a glass case-back which enables you to view the 23 jewels movement of your watch. Unlike other dive watches, the crown of SNZF17 doesn’t screw down. The case has a 41mm diameter and a thickness of 12mm without the crown giving the watch a nice profile. Seiko SNZF17 has a contrasting and easy to read dial with a handy date and day display positioned at the 3 o’clock mark. The hour markers and hands are well designed and generously coated with high-quality lume. The strap of Seiko SNZF17 is 22mm wide and stainless steel. It has a fold-over style-clasp that features a safety catch. At SNZF17 heart is a self-winding 7S36 automatic movement with 23 jewels running at 21,600 BPH which gives these watch even six ticks per/second. The mechanism also boasts a 41 hours power reserve but doesn’t feature hacking or manual winding. 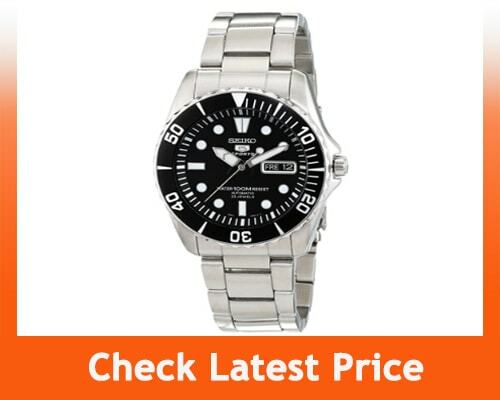 Seiko SNZF17 has a water resistance rating of about 100m making it ideal for swimming, recreational surfing, and sailing. Water resistance rating is 100m depth. SNZF17 is a classic dive watch but can feel a bit heavy for users who are used to lighter dive watches. The old school design is durable and appealing to the users. This dive watch’s self-winded movement, so you don’t need a manual winding to jump-start it. Orient sums up our list for the best dive watches. It has a reputation for reliable performance and robust construction. It’s a reliable mechanical dive watch on the market. Mark II case is a brushed stainless steel material making it sturdy. The diameter of the case is 41mm, and the thickness is 13mm meaning it can fit a wide range of wrists. Attached to the case is a stainless steel bracelet that features an even operating push-button with a deployant clasp closure for safety and a fitted look. The Mako II prides itself with 120-clicks compared to 60-clicks of the original Mako which give it an expensive feel. The bezel is also unidirectional for improved precision and has minute markings. Mako 2 has an explorer markers design with numeral markers at 9, 6 and 12 o’clock. The dial window of Mako II is mineral crystal, and it’s a scratch magnet. With mineral crystal, you need to take extra care of your watch to prevent it from scratching. Mako II has two versions of a dial allowing you to choose the color you like best. A sunburst blue dial and a matte black dial. The black dial is easy to read while the blue dial is elegant and attracts more attention. The Mako II boasts an upgraded Caliber F6922 automatic Japanese movement with 22 jewels that beats six times per/second. It also boasts 40-hours power reserve and accuracy of around +-15 seconds. The movement is hand winding, self-winding, and it hacks [second-hand halts mainly when the crown is pulled out]. Mako II doesn’t require a battery as your movement powers it. Mako II is classic dive watch and much affordable for an automatic timepiece. The dial has a great design, and the upgraded movement increases its value compared to the original Mako. 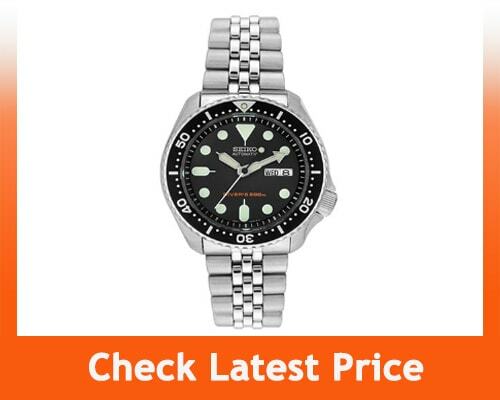 With improved movement, it offers better performance than its competitor Seiko SKX007. Our top pick among the five best dive watches under $200 is the Seiko Men’s SKX007K for various reasons. Compared to the rest of the pieces this has more personalized features that make it stand out. Most people like it since it’s an elegant timepiece that is easy to read. Its high-end features are far above the price of this watch. For an automatic watch, it reasonably keeps track of time, and the looks are more appealing enabling you to use it as a style accessory. The first aspect that should be your priority when buying a dive watch is the material and the construction of the case. The structure should be durable, and the material should be reliable to ensure that the watch serves you for a long time. The watch is subjected to stay underwater for long hence the need to go for a material that can handle different diving conditions. Apart from the case, you should also ensure that the strap and bracelet are sturdy and fit well to your wrist. Go for a dive watch that has a water-resistant rating that suits your water activity sport. Different dive watches have varied levels of water-resistant, but a standard dive watch should be able to withstand pressure and water to at least 200m/660ft depth. While some dive watches require a battery to function, some are mechanical and doesn’t need a battery to work. Both of the watches have their pros and cons, so the choice is entirely yours to decide which suits your needs best. Your movement powers a mechanical dive watch saving you the struggle of having to replace batteries now and then. However, dive watches powered by a battery are more durable since they don’t have a lot of moving pieces inside. The standard mechanisms found in dive watches are automatic and quartz. Most people prefer dive watches with quartz mechanism since they are considered more accurate. The Automatic watches mechanism depends on the movement of your wrist making it not as accurate as quartz which is battery-powered. How Water-Resistant Should the Best Dive Watch Be? According to the ISO (International Standards Organization), a dive watch should be 100 meters water resistant. However, some dive watches claim even 200-300 meters water resistance. If you’re a recreational diver, the furthest you will go is probably around 40 meters deep. How Do I Ensure That My Dive Watch Retains Its Water Resistance? It’s obvious that a dive watch will become less water resistant as its gaskets age, but you can make it last longer by ensuring that it does not get knocked nor most rough treatments. What Are the Most Important Features a Dive Watch? Mostly, this will depend on how you’ll be using the watch. Most have a rotating bezel to measure elapsed time. If you’ll be using it for diving, ensure that it has luminous hands plus markers that are readable under water. Others include: time-preselecting device, a dial that you can easily read even when 25 cm away or in the dark, a good indicator, rubber strap, or titanium or steel bracelet. Depth sensor and/or helium valve. In the above list, you’ll get the 5 best dive watches under $200 reviewed. From the list, you will undoubtedly get a piece that suits your needs best. These watches are indispensable, and even if you have dive computers, you will still need them as a backup. They are water resistant, with durable construction and have the ability to withstand extreme diving conditions. Whether you need a watch that will help you track time when diving or just a rugged, stylish wristwatch that’s useful, these best-looking watches are a perfect match.